Simple enough on the height issues. Make sure the plans are detailed on that regard, and make sure the final product meets it. 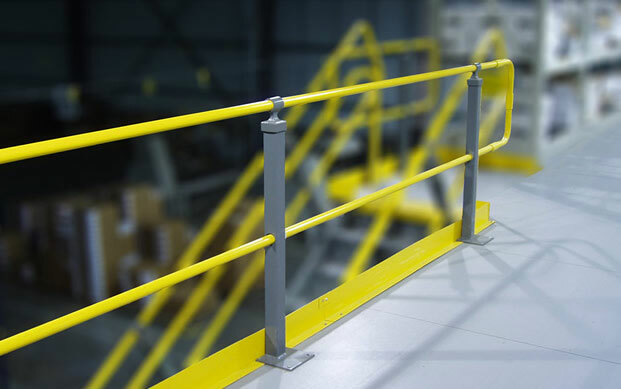 Mid-rails, screens, mesh, intermediate vertical members, or equivalent intermediate structural members shall be installed between the top edge of the guardrail system and the walking/working surface when there is no wall or parapet wall at least 21 inches (53 cm) high. In many cases, the mid-rails are for seismic areas. They are more expensive — about $1,100 more for a mezzanine approximately 30 x 30 — but often worth it, even if code doesn’t specify a mid-rail. And while a thousand dollars isn’t cheap, it might end up that way because it makes it more difficult for things to slip between the upper & lower rail. When the 200 pound (890 N) test load specified in paragraph (b)(3) of this section (§ 1926.502) is applied in a downward direction, the top edge of the guardrail shall not deflect to a height less than 39 inches (1.0 m) above the walking/working level. Guardrail system components selected and constructed in accordance with the appendix B to sub-part M of this part will be deemed to meet this requirement. There is a lot more to understand. I recommend an experienced mezzanine vendor, but if you do go the fabrication shop or contractor route and they aren’t experienced with platform work, be aware of the safety rules and how they apply to you. Check with the OSHA website, get your building permits (in some areas, a mezzanine of certain size can be considered a “second floor” and that opens up a new can of worms) You also need to be sure be sure that you’re meeting IBC rules and cover all of your bases.